Spring Fashion may be daunting for many, as we shed from the Winter bulk to a more Vivant Spring/Summer Collection. Where does one begin? What style is right for the season? Or better yet, what colors should you be wearing? These are some of the many questions you may have asked yourself. However, fret not, spring is simple at iTailor.com. Spring brings style! It is a season highly anticipated in the fashion world. It allows the overcoat to stay in the closet, and let’s everyone add some color back into their wardrobe, or should we say “custom wardrobe”. So “where does one begin”? Whilst we offer fabrics that are ideal for year-round wear, we highly recommend our linen fabrics and pastel shades such as pink, white, lavender to welcome the warmer climate. Ditch the depressed winter looks and add in some brilliant colors like pink(many different shades), light blue or even purple. Spring is about more vibrant colors (think about your surroundings.. the green grass, the colorful flowers, and the bright blue skies above) Our custom shirts are made from 100% premium cotton that stands the test of time, so don’t worry about them fading out before next spring. On a side-note, most spring colors are perfect for summertime as well so.. 9 times out 10 if you style yourself right for spring you’ve got summer style nearly finished. You made your new year’s resolution months ago, you lost the weight and you’re looking great! Now it’s time to show everyone what your discipline bought you. 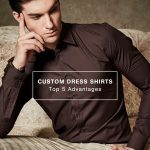 Men’s Custom Shirts are what started iTailor, and from a global perspective our quality is second to none. Not to mention our price too. Now, how you wear it and when you wear it is totally up to you. Whether you like to roll your sleeves or maybe you like a relaxed collar, your call. If you’re the type to tuck-in or leave out don’t worry. Remember, our men’s dress shirts are custom fitted and tailor made shirts. The tuck factor, well you’re the king of it now and your fit will have everyone turning your way. Break out the gingham check, plaid, and linen. Show a bit of classic taste but with a little modern style. 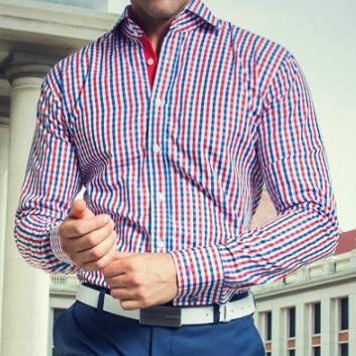 If you’re not a fan of plaid and gingham you can still pull off timeless looks with stripes and solids, and for the very bold gents out there floral print options can work very well too. Pair these shirts with some iTailor Chino’s and you’re on your way to spring style royalty. So that’s it for this week, if you liked what you read or have any questions please feel free to let us know and comment below! If you’d like to design your very own custom shirts from nearly 500 fabric options click here and start designing today! Don’t forget to subscribe to our newsletter below for free company updates and our weekly sales on custom shirts, suits, luxury designer shoes, and more! Which fabric is the purple one, shown on the picture? Thank you for your inquiry. That is one of our linen custom dress shirts. Unfortunately they are out of stock this week. But we do have other linen dress shirts in the iTailor Collection right here – http://bit.ly/1FBkUtv Please let us know if you need anything further, thank you! Summer season calls for a fresh lightness in men’s suit in material as nicely as in color. Thanks so much for sharing these shirts. I love that you can customize them to your liking and that there is a variety of colors and patterns available! I think fit is the key to any shirt as well. I will definitely have to try these out! That’s right Fit is the Key! You can always get a perfect fit at http://www.itailor.com!